I’ve done field work in lots of places, but this was the first time I’d had to wear a purple sash. 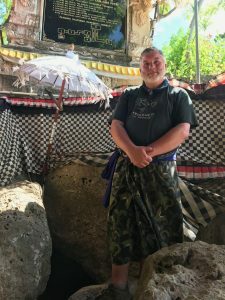 The sash and sarong were hired for 5,000 rupiah (about 50c) from a shop by the main road on the island of Nusa Penida, near Bali, Indonesia. I was about to venture into a cave to look for endangered crabs, but because the cave is also a popular Hindu temple I needed to be properly attired. 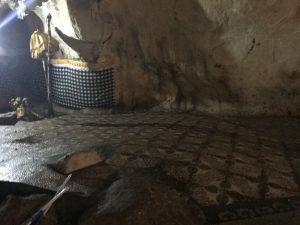 At one point the Giri Putri temple would have just been a smallish hole partway up a cliff face; you have to crouch, clamber, and shuffle to enter, before the ceiling rises and you’re in one of several roomy caves. Today, there are steps, buildings, white-clad priests praying, and a visitor’s book for you to sign and donate about Rp 20,000; I was a bit more generous. Giri Putri has been a holy place for a long time, but it’s only recently we realised it was a biodiversity hotspot as well. Giri Putri crab. Photo by the late Tony Whitten. Back in 1993 Australian biologist Tony Whitten ventured into the cave when it was just a hole in the hillside. He was struck by the number of crabs scuttling about on the cave floor, and collected a few. They turned out to belong to not one but two new species, Karstarma emdi and K. balicum. 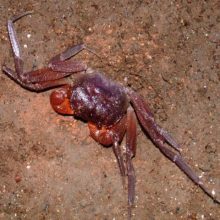 Freshwater crabs like these can be found in several cave systems in south-east Asia: they have long legs for feeling their way about in total darkness. Isolation and time leads to speciation, and the two Karstarma species in Giri Putri seem to be found nowhere else but this one small cave system on this single island. Unfortunately, they’re under threat. 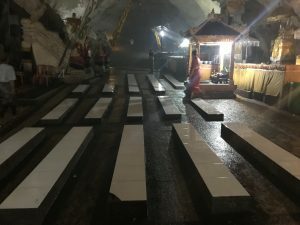 Giri Putri is now a busy temple, with artificial lighting everywhere, large fans to keep the air moving, lots of concreted and tiled floor, and benches and altars set up in several places. Whitten noted that every few years when he visited there were fewer crabs to be seen. In the hour I spent searching with a headlamp in the dark corners of the cave I didn’t see any at all. I asked one priest if the crabs were there; he told me “sometimes”. The IUCN is pushing for better monitoring of the crab population, and the temple authorities seem keen to work to minimise human impact, so let’s hope. But really there needs to be a resident biologist there studying the cave environment and ecology to come up with a management plan. There’s plenty of other life in Giri Putri, though. In all the dark corners I was disturbing bats which zipped through my torch beam in silence, sometimes an inch from my face. I was very conscious that I hadn’t gotten a rabies vaccination before coming to Bali; killed by a rabid bat is not my preferred demise. 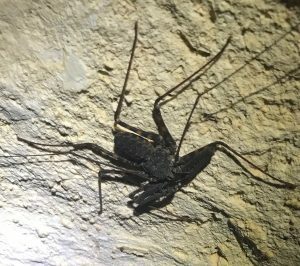 The walls of the cave were crawling with invertebrates: large Periplaneta cockroaches, camel crickets that looked just like the cave wētā back in New Zealand, and good-sized tailless whip scorpions. I took photos as best I could with my phone. Back home, I uploaded the photos to NatureWatch and tried to get IDs. I sent the whip scorpion photos to Mark Harvey at the Western Australian Museum to see what he thought. Mark placed them in the family Phrynidae, probably the genus Phrynus. This was interesting, because almost all species of Phrynus are found in the New World, through Mexico and Central America. The sole exception is a species Mark himself named and described: Phrynus exsul from the island of Flores, Indonesia, thousands of kilometres away from its closest relatives. Only one problem: Bali is 400 km away from Flores. So either these beasties are Phrynus exsul and a new record far to the west of where they were first observed, or they’re an undescribed species of Phrynus, only the second known from outside the neotropics. A bit of quick searching reveals there are similar-looking whip scorpions at nearby Kentung Cave and probably other caves on Penida. Who can say how many species, and whether they’re endemic or endangered? Whip scorpions are not especially inconspicuous. Giri Putri is right by the main road, and a popular tourist destination. Nusa Penida is a short ferry ride from Bali, which has millions of tourists a year. And it it seems that in over 20 years nobody has thought to collect one of these critters, take it to an expert, and find out if it’s an undescribed species or not. This is the plight of the tropics writ small: stuffed full of biodiversity, which is disappearing faster than we can discover and put a name to it. This entry was posted in Field Notes on 20 May 2018 by Mike.